MasterCard is to sponsor next year's Rugby World Cup in England, with the payments firm set to use the tournament to push its NFC-enabled and mobile payment systems. The firm kicked off the deal with an event today in London that featured New Zealand rugby star Dan Carter booting a number of balls in the direction of Tower Bridge. Ann Cairns, president of international markets for MasterCard Worldwide, told Marketing: "We’re thrilled to be sponsoring the Rugby World Cup in England, because it’s great to come to the home of rugby. "From our point of view, it’s the perfect fit. We love the values that rugby brings – it’s a family game and fits well with our Priceless experiences." The agreement allows MasterCard to link its Priceless brand campaign into the tournament, with plans afoot to tie together its other cultural activities, including in music. The brand will run activities such as Priceless experiences in the build-up to and during the event. Cairns pointed out that next year’s event would involve a high number of international and UK rugby fans visiting London and the South East, giving them exposure to the brand and its services. She said: "What’s happening here as far as business is concerned is that everything is becoming mobile. She cited NFC technology being installed on buses, the London Underground and on train services across the country, which would allow consumers to use their debit and credit cards to make contactless payments. "We’re seeing all these things coming together and replacing cash," she said, adding that MasterCard’s contactless payment would enable consumers to pay for goods in rugby stadia, at hotels and restaurants in London and on the London Eye. MasterCard also recently signed an agreement with mobile payment joint venture Weve to facilitate mobile payments. Cairns said it was set to launch in the first quarter of 2015. She said: "People recognise us as one of the strongest consumer brands in the world even though we don’t sell direct to consumers." Cairns pointed out that, unlike the London 2012 Olympics, when Visa was the sole provider of contactless payment systems within the Olympic Park, consumers will be able to use an array of payment systems during the Rugby World Cup. 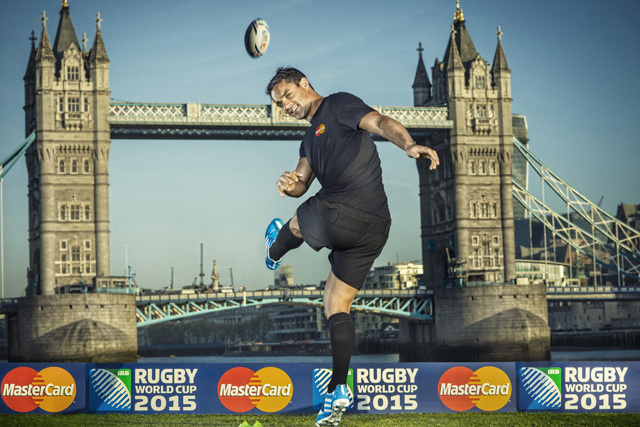 MasterCard began its relationship with the global tournament at the Rugby World Cup 2011 in New Zealand.